Do new systems boost ridership, relieve congestion? 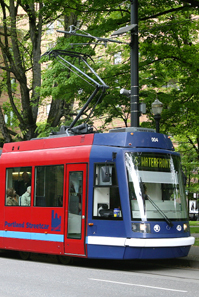 A streetcar system launched in Portland, Ore., in 2001 spurred the revival of a down-at-the-heels industrial zone and touched off new interest in streetcars and light rail across the country. Pressed by rising gas prices, highway gridlock and global-warming concerns, cities are spending unprecedented amounts on public transit systems — from streetcars and other "light-rail" lines to commuter trains and rapid-transit buses. They also are experimenting with "congestion-pricing" plans that impose tolls on motorists to induce them to use transit or alter driving habits. While traffic congestion is partly behind the transit boom, it is not the only force driving it. Some light-rail projects are built hand-in-hand with "transit-oriented developments" — walkable, mixed-use projects designed to attract residents, shoppers and office workers to urban neighborhoods. Cities from Portland, Ore., to Charlotte, N.C., have embraced rail projects, but critics argue that such ventures aren't boosting ridership or reducing traffic. Some worry, too, that they benefit the wealthy at the expense of low-income residents whose needs may not be well-served by new rail lines.